For lazy days basking by the pool or hot nights dancing to the DJ’s beat, the 6th Pool Bar & Lounge is the place to be in Manila’s vibrant Quezon City area. Unwind after a day in the city with our signature drinks and snacks. Life is good at Novotel. 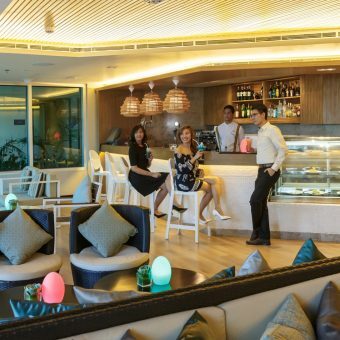 The 6th Pool Bar & Lounge is a go-to hotspot in Quezon City. After a game or a concert at the Smart Araneta Coliseum next door, locals gather here to celebrate and wind down. Business professionals stop by for after-work drinks and casual meals. The stylish outdoor area beckons with its oversized loungers and parasols. By day, enjoy cool cocktails between laps in the pool. After sunset, the place transforms into an outdoor nightclub. Test your talents on Open Mic Night (Wednesdays and Saturdays), or admire those of our musicians and DJs on Acoustic Thursdays and Freedom Fridays.